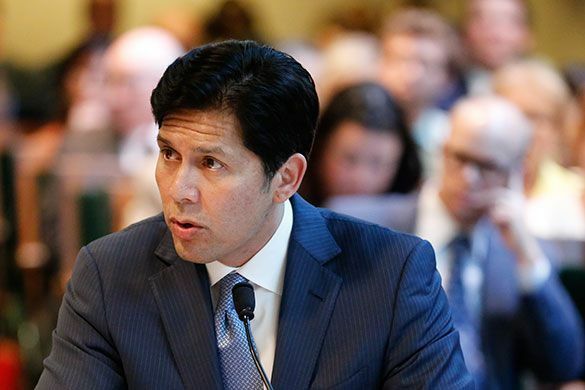 Senate President Pro Tempore Kevin de León, D-Los Angeles, on Thursday unveiled his plan to allow Californians to skirt the provision of the newly passed federal tax overhaul that caps the state and local tax deduction (SALT), in just the latest effort by Democrats in the Golden State to thwart the Trump agenda in Washington. Under the plan, state residents could make charitable contributions to a state fund, called the California Excellence Fund, and be able to deduct those payments on their federal taxes. The move would decrease the amount of taxes Californians have to pay under the new law, as the deduction for charitable contributions remains uncapped. In California, the average taxpayer claimed $18,000 in state and local deductions in 2015, according to IRS data. Under the new law, the deduction is capped at $10,000, a provision that hurts high-tax blue states. The “Protect California Taxpayers Act” essentially allows state taxpayers to reclassify their tax payments as charitable deductions, letting them deduct the entire amount on their federal tax returns. Additionally, the legislation could serve as a model for other states to circumvent the law. Just recently, Gov. Andrew Cuomo suggested that New York will take its own action, possibly mirroring California’s. While it’s not entirely clear if the proposed law would comport with current IRS guidelines for charitable deductions, similar frameworks, on a smaller scale, have been upheld by the U.S. Supreme Court. In 2011, the U.S. Supreme Court upheld a tax break for religious schools in Arizona Christian School Tuition Organization v. Winn, ruling that a dollar-for-dollar tax credit that pays for children to go to religious schools cannot be challenged on constitutional grounds. The High Court found that the plaintiffs did not have standing to bring suit. And while Congress could simply pass a new law or the IRS could change the rules for charitable deductions, that is unlikely because existing tax credit regimes provide school choice opportunities, an issue popular with Republicans. For the California state Senate leader, the bill also provides fuel for his primary campaign against longtime incumbent Sen. Dianne Feinstein to show the state’s liberal voters that he’s more equipped to aggressively combat Republicans in Washington.